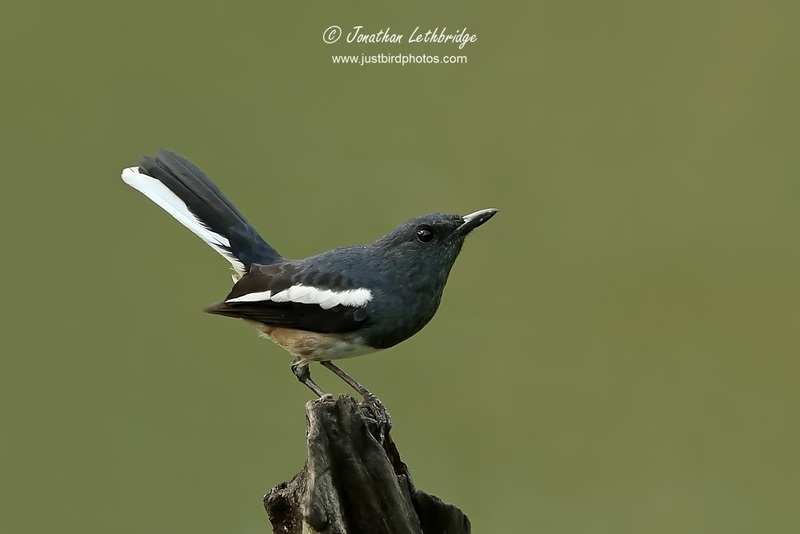 Other than Mynas, Oriental Magpie Robin is possibly the commonest birds encountered in South-east Asia. They are extremely vocal with a lovely song - indeed they are also a very common cage bird and when I visited the bird market in Hong Kong there were loads of them - unfortunately. I found this bird at the Singapore Botanical Garden, which is an oasis in what is already an incredibly green city. Attracted initially by their calls, I found a pair investigating nesting spots alongside one of the ponds on the eastern side of the garden, and from a higher vantage point managed to get a reasonably clean shot which (in the interests of full transparency) I have turned into a totally clean shot with a small amount of wizardry on the left hand side. I had a photo like this in my mind before I left, so I'm pretty pleased that I managed to get this specific pose. The bird's mate was just out of shot on the right, and before too long they had both moved on around the margins.